If you have been following along with our blog, you know that eelgrass has drastically declined in Morro Bay since 2007, and that we’ve been working hard to address this issue. 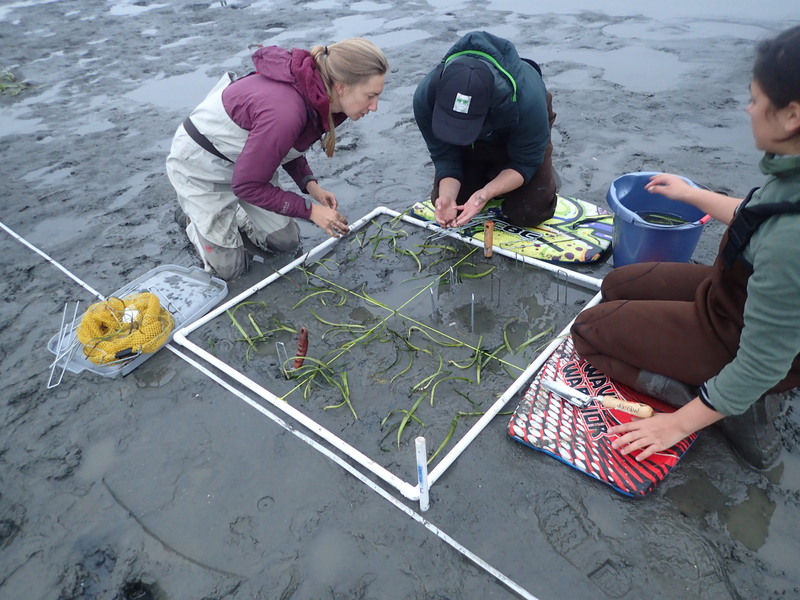 Our staff members have been collaborating with agencies, researchers, and volunteers to conduct extensive monitoring and research efforts that will help us better understand eelgrass growth and the conditions that might be impacting it. Read on to learn about our eelgrass restoration work and other eelgrass efforts that we took on in 2017. In 2017, we put the knowledge we have gained to work with a small-scale experimental eelgrass transplanting. 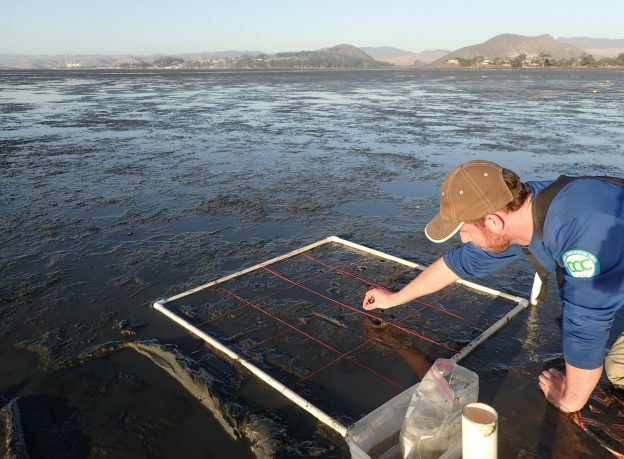 Partnering with Cal Poly San Luis Obispo (Cal Poly), California Sea Grant, National Oceanic and Atmospheric Administration (NOAA), and California Department of Fish and Wildlife (CDFW), we harvested eelgrass from a healthy eelgrass bed at Coleman Beach. The map on the left shows eelgrass coverage in 2007. 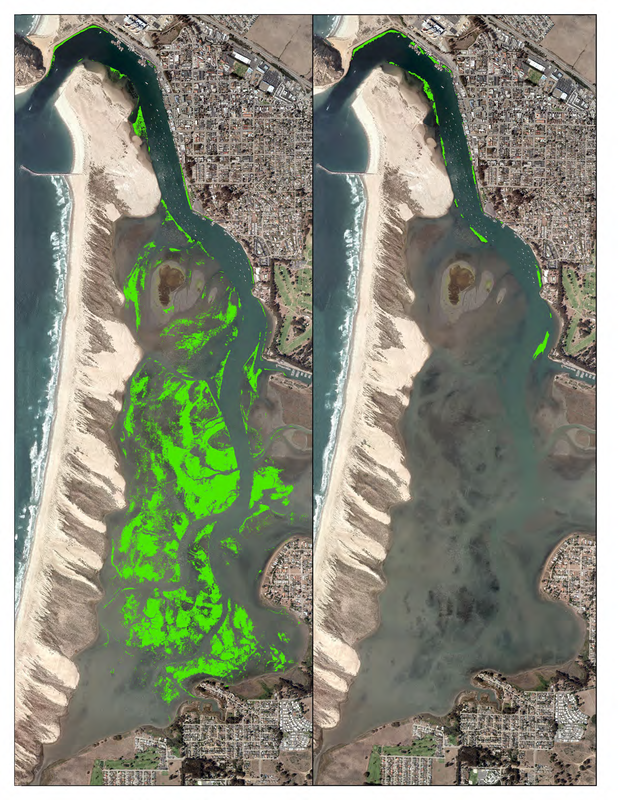 The map on the right shows eelgrass coverage in 2015. 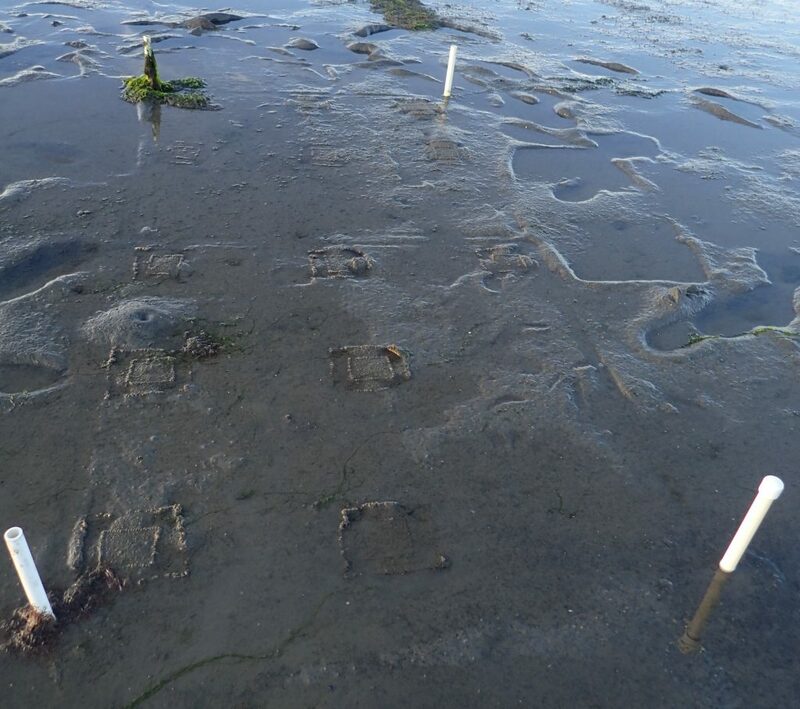 With the additional help of a small and hardy group of volunteers and Watershed Stewards Program members, we prepared the eelgrass on shore and then transplanted it in two different locations at a very low tide. One transplant site is located in the forebay across the channel from Grassy Island. The other is located near the two oyster farms in the midbay. This photograph shows staff and volunteers, including Restoration Projects Manager Carolyn Geraghty (far left) transplanting eelgrass. 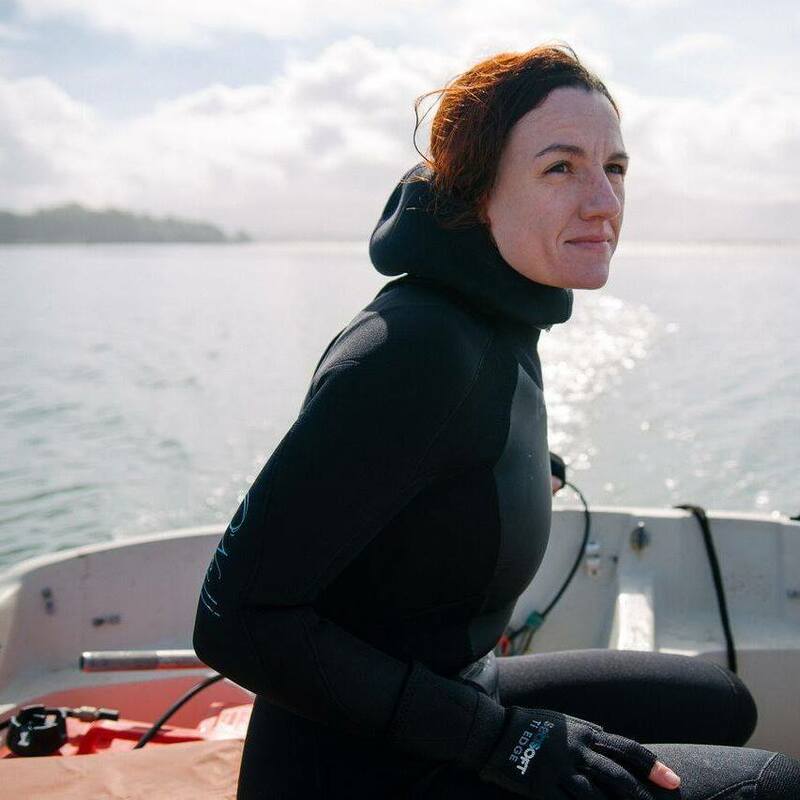 Graduate student Erin Aiello’s studies focus is on eelgrass in Morro Bay. We also harvested and dispersed eelgrass seeds this fall in order to expand eelgrass growth. We first placed the seeds we had collected in small, hand-made burlap bags. 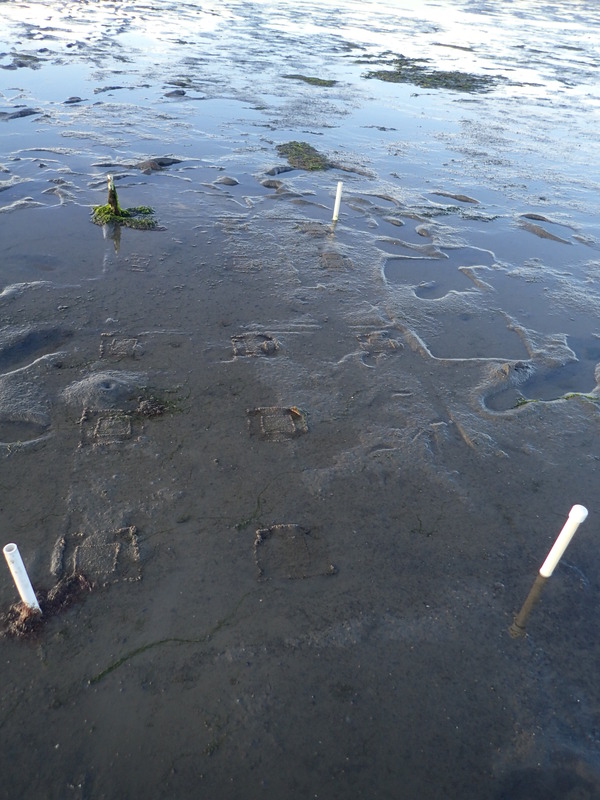 Then, we staked the bags down to the bay bottom during very low tides. This process helps to keep the seeds in areas where we think they will be able to germinate and survive. Tim, a Watershed Stewards Program member, plants seeds. This photograph shows burlap seed bags staked in a plot on the bay floor. The seeds will germinate in the bags and grow through the loosely-woven fabric. This technique allows us to carefully place seeds where we think they will have the best chance to survive and thrive. During this process, we learned a lot about eelgrass’ flowering patterns and the overall seeding process. So far, these efforts seem to be paying off. We have seen about 15 seeds germinate at the back bay site, and we will continue to monitor them closely to see how they fare. These efforts have also provided us with valuable information to support future eelgrass restoration work. In order to keep careful track of the health and growth of the existing eelgrass beds—an effort we’ve undertaken since 2002—staff have continued to walk, paddle, snorkel and boat to track the status of this valuable habitat type. 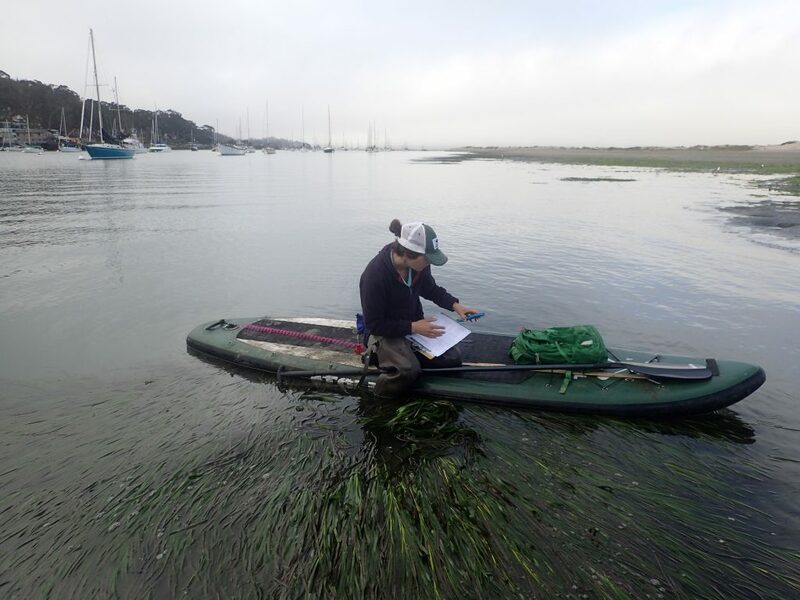 Monitoring Coordinator Karissa checks on eelgrass seeds from her floating desk. We will continue collaborating with our partners, conducting research and monitoring, and doing our best to address the issues facing eelgrass. Stay tuned; we’ll complete our next round of transplant efforts in spring of 2018 and will report back here.